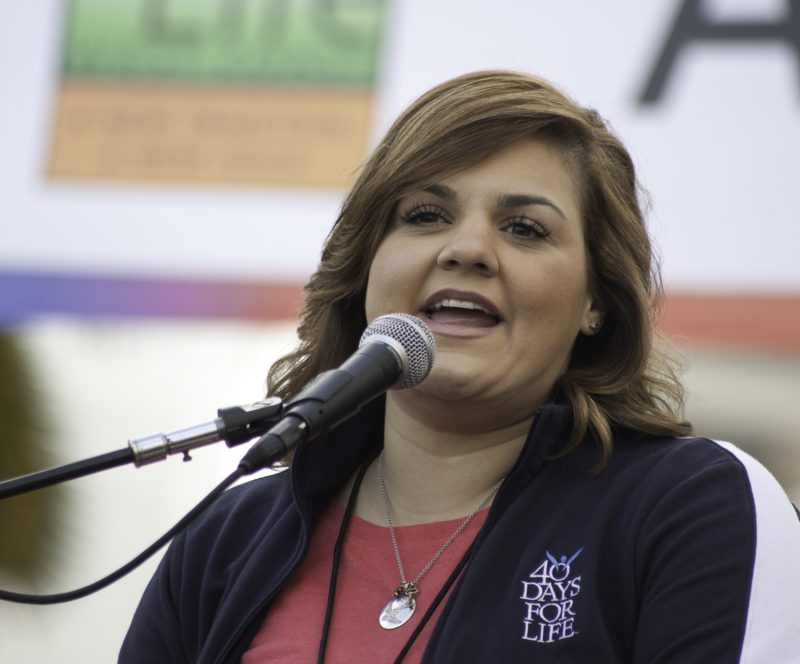 Abby Johnson, a former Planned Parenthood director who left her job after assisting in the abortion of a 13-week-old fetus, serves as CEO of the pro-life ministry “And Then There Were None.” In 2012 she left the Episcopalian faith to become a Catholic because her public pro-life stance was welcomed there. She has since worked as a pro-life activist and author. Ms. Johnson is the subject of the upcoming movie “Unplanned,” which is based on her memoir of the same name. It chronicles her rise at Planned Parenthood from volunteer to clinic director as well as her own two abortions. The film is slated to open in theaters on March 22, 2019. On Dec. 11, I interviewed Ms. Johnson by telephone about her story and work. The following transcript of our conversation has been edited for style and length. The annual March for Life occurs in Washington, D.C., close to the January 22 anniversary of the U.S. Supreme Court decision in Roe v. Wade that legalized abortion. What realistic chance is there at this point of overturning that law? I think it’s pretty realistic. With the justices we currently have, we will need to bring the right case to challenge the constitutionality of abortion. We can’t just bring a case that happens to be pro-life; we really have to select the right case. If we do that, the chances are very high. Everyone who says they’re Christian, needs to be directly involved in the pro-life movement in some way. St. Teresa of Calcutta used to say that if people didn’t want their babies, she would take them. Short of overturning Roe v. Wade, what are some realistic things we can personally do right now to protect life in the womb? Everyone who says they’re pro-life, everyone who says they’re Christian, needs to be directly involved in the pro-life movement in some way. So volunteer with your local pregnancy resource center, get involved with various national organizations—I mean, laws are important, but our goal should not be to make abortion illegal. Our goal should be to make abortion unthinkable. To do that, we have to be people willing to be part of the solution. The upcoming film “Unplanned” details your career in Planned Parenthood and later decision to quit. What motivated you to volunteer and later serve as director of a Planned Parenthood clinic? I got involved in college not really knowing anything about Planned Parenthood. I grew up in a home that was pro-life, against abortion, but we didn’t talk about what that meant and I didn’t know anything about Planned Parenthood. I initially got involved as a student believing their goal was to help women at a difficult time in their life. I think that’s why the majority of people get involved in Planned Parenthood work. It’s not because they have a desire to kill babies, it’s because they are there to help women. I realized there weren’t very many differences between me and this child in the womb. What made you so good at your job as a Planned Parenthood director? I was very well versed in Planned Parenthood’s talking points because I really believed them to be true. I was pretty convincing in that way. I became a very good salesperson for the organization, selling their highest revenue-generating product, and that was abortion. I had a lot of drive and ambition, a desire to do good. You quit your job at Planned Parenthood after assisting at the abortion of a 13-week old fetus. What about that experience changed your mind? Seeing a child that young fight and struggle against the abortion instrument led me to re-evaluate what I believed and had been told was true. I realized there weren’t very many differences between me and this child in the womb. We both had the basic fight-or-flight human response. We were in different locations and we were different sizes, but our humanity was the same. That’s what caused me to ask: “What are we doing here?” We might think we are helping women, but we are doing it at the expense of innocent human life. After leaving your job, you also left mainline Protestantism and converted to Catholicism. What attracted you to the Catholic faith? I grew up in South Louisiana, where a majority of people and most of my friends were Roman Catholic, so I always had a lot of curiosity about the Catholic faith. When I left Planned Parenthood, I left all my friends behind and developed new friends who were pro-life. They all happened to Catholic and they kept inviting me and my husband to mass. We thought we would hate it but went just to sort of shut them up, and it just felt right. It felt like it was home, and we weren’t sure why at the time, but we found ourselves in RCIA and really fell in love with the church. The more we read, the more we realized the truth and fullness of Christ was within the Catholic Church, and that’s where we wanted to be. Who are your role models in the faith, either living or dead? Fulton Sheen is a model to me. I read a lot of his writings and have read a lot about him. Also, of course, St. Teresa of Calcutta. She was such a model of compassion and mercy but also of justice. I think she’s a good representation of what it truly means to be pro-life. We pray a family rosary every day. We try to attend adoration once a month, but it’s difficult because we have so many children and they’re not huge fans. My husband and I also pray together; we feel it’s an important part of who were are as a family and our identity as Catholics. My favorite passage is Psalm 30, a passage about deliverance. For me, it’s a powerful example of what Christ has done in my own life. When I felt like there was no hope for me, he was there waiting for me, waiting to bring me joy. You had two abortions. What do you say to people who believe women only oppose abortion out of cultural and religious shame? More people are embracing the pro-life movement because of the secular and scientific arguments that can be made. As Christians, we root everything in God, but more and more people are listening to the stories of women who have been hurt by abortion. It’s very hard to argue with personal experience. The case to be pro-life from a scientific perspective is also very strong and it’s important to talk about it from a non-religious standpoint to connect with people where they are. Abortion is not simply a religious issue. Our ministry alone has helped more than 500 abortion workers leave the industry. So what reason would someone of no faith have to be pro-life? There’s a continuum of life, and science says life begins when cells reproduce and grow, which begins at conception and ends at death. Any unnatural interruption of that lifespan is killing. Probably the most unscientific argument you can make is that it’s not a human being. It’s getting harder for pro-choicers to argue that because science has come so far. So they’re using more emotional arguments like women’s rights instead of focusing on the child in the womb. In his weekly general audience this past October 10, Pope Francis compared abortion to hiring a hit man to “fix a problem.” If you could say one thing to Pope Francis about abortion in the United States, what would it be? His comments are hard to hear, and they sort of take you aback, but his analogy is right-on. He’s a pope of the world, not of the United States, but I like the fact that he does speak about abortion and I would just encourage him to continue. Our problems in the United States are not isolated; most first-world countries have a rate of about one in three women having abortions. So we need the Holy Father to take a bold stand about abortion and do it often. What do you hope people will take away from your life? I hope they see that redemption is possible for anyone, no matter how far they have strayed from the path God created for them. I always want people to see conversion is possible for anyone and that it’s happening. Stories like mine are not few and far between. Our ministry alone has helped more than 500 abortion workers leave the industry. It’s important that we recognize the humanity and dignity of people who disagree with us, people working in the abortion industry, and that our words and how we treat them matter. We want our ministry to grow, abortion clinics to close, abortion clinic workers to know Christ, and women to choose life because of the stories they’re hearing from these former abortion workers and from their real-life experiences. We have seven former abortion doctors now working full-time in our ministry. I was disappointed by Ms. Johnson's narrow view of what constitutes a pro-life Catholic. Where is place of the "seamless garment" approach to life? Because the "seamless garment" phrase is an idiotic rationalization for doing nothing about abortion. It panders to the vanity of those who want to think of themselves as superior for doing nothing, for defining moral equivalency between things that are not morally equivalent such as capital punishment, which is not even an intrinsic evil. More demonic is the idiotic mindset that says, until we eliminate poverty, which is impossible, we have no right to oppose abortion. Two uses of "idiotic" and one use each of "demonic" and "evil." Impressive. And, yet, you don't seem to understand the "seamless garment" approach to life issues, or how it fits into an understanding of Catholic moral and social teaching. No one asserted moral equivalency or told you that you couldn't oppose abortion. Great moral principles & beliefs are embedded in contexts. You don't tell us how you oppose it, e.g., with every fiber of your being, I hope (time and resources, right?). How would you go about re-criminalizing it? Unfortunately, many self-identified "pro-lifers" engage in posturing. I think you do not understand the seamless garment. It does not say before we do anything about abortion we must eliminate poverty - it is about adopting a whole pro-life view that includes opposition to all death culture -- from abortion to euthanasia to capital punishment and (usually) war. Secondly the way you talk to people is inappropriate and finally, with your attitude I imagine you haven't changed many people's hearts and minds about abortion - so it is possible you are not adding much value to the problem or bringing about conversions of the heart. SO instead of getting angry - why not try a more loving and joyful approach? You should criticize the narrow scope of the article. This article focused on abortion because Ms. Johnson used to be a abortion worker. If she used to perform executions, this would be about her view on the death penalty. However, while the death penalty sometimes claims the lives of innocent people, abortion always kills innocent people, and it kills hundred or even thousands more than the death penalty. I'm into the seamless garment approach. However, I recognize that tackling abortion is given and should be given higher priority at the moment, because it's a much larger problem. Mr. Killoran, thanks for reading. This is an article specifically about abortion and Ms. Johnson's experiences in that industry. I did not ask her about the seamless garment and am not aware that she takes any position on it in the interview. In a similar interview with attorney and death row chaplain Dale Recinella on the death penalty, I did not ask him about abortion or presume that his opposition to the death penalty implied a "narrow view" of the seamless garment, because that likewise was not the topic of our conversation. In both cases, I interviewed someone working a particular area of pro-life ministry about their experiences, and we did not delve into their views on other areas. But I charitably presume they, as practicing Catholics, believe everything the Church believes, reveals, and teaches to be true. I hope you might consider these words in a similarly charitable light. God bless. Thanks for the clarification Fr. Salai. I do want to push back on one thing: I would not have offered my comment if the title of the interview was "anti-abortion" and not "pro-life." The latter is a capacious term that has generated considerable debate. The anti-death penalty position is is very much connected to a pro-life perspective but the battle over abortion was the genesis of the contemporary pro-life perspective. Vince - Your "push back" does suggest that you may not be consistently pro-life in the sense that you want both abortion and capital punishment outlawed, but only the latter outlawed. Given the massively disproportionate killing that goes on with abortion (1 million each year) and capital executions (25 individuals in 2018), wouldn't someone who wants to abolish the death penalty but is "pro-choice" on abortion be better characterized as part of the pro-killer movement? There is being against abortion, and then there is the Pro-Life Movement. One of the key problems with the pro-life movement is its inability to provide a blueprint for re-criminalizing abortion. This includes a detailed plan for hope they would prosecute women who procure abortions. If abortion is as serious as they assert then not only would all their resources and waking hours be spent fighting it: they would articulate a detailed and coherent re-criminalization plan. We'v been waiting over forty-five years. . . Thank you Mr. Killoran. I did not write the headline and neither did Ms. Johnson. Still, the statement that she is a "leader in the pro-life movement," which the headline states, seems to me an objective descriptor that does not claim to define pro-life or represent her position. Let's continue to pray for one another and for all the marginalized on this first day of the USCCB's 9 Days for Life novena. Fr. Salai, Honestly, I, myself, have written numerous times in this magazine about the facts regarding making abortion a crime in any state or country. So why do You still and "America Mag." still push this type of response to the church or to any country regarding abortion? The Guttmacher FACTS below are real and prove your stand only causes more deaths of the unborn (which you supposedly care about) and vastly more deaths of women which I think we all know are the real second rate lives to many priests. The stricter the laws on both abortion and birth control the higher the maternal death rates and the rates of the deaths of the unborn across the globe. The Church has known these facts for over a decade, and you, I would presume, know them by now too so maybe you can explain to me how you and our church leaders are not the mass murders now? Because the math does not work out as you being the great saviors of the unborn given the facts. Closing Planned Parenthood Clinics has also resulted in poor women not getting necessary care and cancer testing and these clinics have not been replaced by equivalent care clinics where these women live and had Planned Parenthood from which to get care. Not to mention the amount of poor women who relied on Planned Parenthood to help them with cheap or free prenatal care. Planned Parenthood also helps bring babies into the world healthy, something Pro-lifers are keen to forget. Currently, the U.S. (until Roe v. Wade is overturned) and Western Europe have the lowest abortion rates worldwide and the evidence seems to prove it is due to their making both abortion and birth control easily accessible. What change are you looking for? an increase in abortion in the U.S.? Again - I bring to you the FACTS - no doubt you will continue to ignore them as it costs you nothing to do so. Note the countries that have the highest rates of abortion are all heavily Catholic. So not only are we killing women and the unborn but the ones we are killing the most would be of our own people. From Guttmacher: Abortion and Birth Control Stats. • The highest annual rate of abortion in 2010–2014 was in the Caribbean, estimated at 59 per 1,000 women of childbearing age, followed by South America, at 48. The lowest rates were in Northern America, at 17, and Western and Northern Europe—at 16 and 18, respectively. • Across regions, Eastern Europe experienced the largest decline in the abortion rate, from 88 in 1990–1994 to 42 in 2010–2014. Despite this decline, there is a persistent gap in rates between Eastern and Western Europe (42 vs. 16) likely reflecting lower use of effective, modern contraceptive methods in Eastern Europe. • The overall abortion rate in Africa was 34 per 1,000 women in 2010–2014. Subregional rates ranged from 31 in Western Africa to 38 in Northern Africa. There has been little if any change in abortion rates in these subregions since 1990–1994. • For Latin America, subregional abortion rates range from 33 in Central America to 48 in South America. Rates have increased slightly since 1990–1994, but not by statistically significant amounts. • Abortion rates in Asia have also fallen since 1990–1994, although not significantly. Asia’s subregions all have rates close to the regional average of 36 per 1,000 women. • High levels of unmet need for contraception help explain the prevalence of abortion in countries with restrictive abortion laws. The World Health Organization Research agrees with the Guttmacher Research. Their results are almost identical. However, neither the W.H.O. or Guttmacher can give us a solid conclusion, due to lack of evidence, as to what happens when countries offer easy access to quality birth control but make their abortion laws stricter. This is due to the fact that most countries either are lenient on both issues or they are strict on access to both abortion and birth control. We could make some confident speculation, based on the global evidence that does exist, that in countries, currently, where laws are strict for both abortion and birth control or where both are criminalized, that were these countries to loosen up laws on birth control access alone and not on abortion, the abortion rates would come down more, and likely closer to where the Western and developed nations are at. However, these countries are not necessarily or likely to get quite as low as the western, industrialized, countries since there does exist evidence that the mere difficulty of access to abortion alone lends, especially in certain cases, to higher abortion rates by itself. A horrible side effect of the above situation is this: 50% of all downs fetuses naturally miscarry in the first trimester, and 40% that make it to the 2nd trimester miscarry then. Fetuses that have other severe health issues often miscarry, naturally, within the first three - four months of pregnancy as well. The amount of downs fetuses that become born infants are very small amounts even for older women. This illness is still quite rare overall. This means many women could end up aborting perfectly healthy fetuses, by the thousands, each year, or more, to avoid the possibility of having an unhealthy baby, and this number increases if women already have other children. One way some western countries avoid this issue is that they keep early abortions legal and allow later abortions into the 4th and 5th month if the fetus has tested unhealthy or the woman's life is in real danger if she remains pregnant. Many married older women think they aren't fertile when they still are and stop taking birth control. The evidence we do have seems to indicate, on a global scale, that despite what seems reasonable in theory, i.e., harsh abortion laws will lower abortion rates, is completely false when put to the test in reality. It just may be that easy access to abortion, and lenient abortion laws, help more to reduce abortion rates than having strict laws against abortion, in any country. Perhaps some morality issues simply cannot be solved by force or threat but must instead be dealt with by respecting the situation of the people involved and helping them out of their place of fear or desperation, with physical and material protections and emotional and spiritual support. We could do much more perhaps by encouraging a choice for good, and for life, without attempting to control women. We could choose to help women in real ways, instead of trying to corner them into doing the Christian thing. "still push this type of response to the church or to any country regarding abortion? The Guttmacher FACTS below are real"
They are partly false and partly misleading and partly true; which is why you fell into the mistake to think that you can treat what Guttmacher says as "facts". 1. "Highly restrictive abortion laws are not associated with lower abortion rates. When countries are grouped according to the grounds under which the procedure is legal, the rate is 37 abortions per 1,000 women of childbearing age where it is prohibited altogether or allowed only to save a woman’s life, compared with 34 per 1,000 where it is available on request, a nonsignificant difference." Considering that abortion rates vary even inside one country a lot (up to a factor of 2,5 between dense cities and rural areas) it borders on the dishonest what Guttmacher does here, to just arrange countries according to abortion laws and thereby deliberately giving the impression that laws against abortion do not effect the number of abortions; one should at least check for other factors and also look at countries with differing abortion laws which are otherwise less different. E.g. compare Irland to GB, instead of sub-sahara Africa to Western Europe; and that comparison - up until 1st January this year - would strongly indicate that Irlands strict abortion ban did have an effect to reduce abortions, as GB has about 15 abortions per 1000 15-44 year old women while Irland had about 6 or 5. "Across regions, Eastern Europe experienced the largest decline in the abortion rate, from 88 in 1990–1994 to 42 in 2010–2014. Despite this decline, there is a persistent gap in rates between Eastern and Western Europe (42 vs. 16) likely reflecting lower use of effective, modern contraceptive methods in Eastern Europe." The best available guess is changes of laws making abortion more illegal, when the countries went from communist - no communist out there who ever saw and abortion he didn't like - to non-communist. 3. "The evidence we do have seems to indicate, on a global scale, that despite what seems reasonable in theory, i.e., harsh abortion laws will lower abortion rates, is completely false when put to the test in reality. It just may be that easy access to abortion, and lenient abortion laws, help more to reduce abortion rates than having strict laws against abortion, in any country. Perhaps some morality issues simply cannot be solved by force or threat but must instead be dealt with by respecting the situation of the people involved and helping them out of their place of fear or desperation, with physical and material protections and emotional and spiritual support. We could do much more perhaps by encouraging a choice for good, and for life, without attempting to control women. We could choose to help women in real ways, instead of trying to corner them into doing the Christian thing." Guttmacher and other pro-abortion advocates have fallen into the false dichotomy, that its either banning abortion as murder or having a lenient and easy access. In Germany the supreme court affirmed that unborn have the right to life according to Art. 2.2 of German constitution and affirmed that unborn have human dignity according to Art. 1.1 of German constitution and that there the German state has a duty to attempt to protect the live of unborn and is required to both use penal code and other means to achieve this, with the German state left quite some freedom how to exactly due to this based on the experience that harsh laws are of limited effectiveness. So there is no need to legally deny the right to life of unborn to cope with the issue, that data so far INDICATES (but does not prove as activists claim) that harsh abortion laws are often of limited effectiveness. And regarding Abby Johnson, she is in my view correct that any improvement of the protection of unborn humans might be greatly advanced by overturning Roe vs Wade, presuming that the result will be something better. Reason is that Roe vs Wade and the following decisions implicitly deny both that unborn humans are humans and that the state would have some sort of duty to protect unborn humans. Real improvements in protecting unborn humans and in helping women finding other solutions than abortion is from a legal point of view likely bound to fail, cause if unborn humans are no humans and if the state would have no duty to protect them even if they were, why make a fuss about some women having abortions due to other people not helping them? If it is a worthless clump of cells, it is not worth any tax payers money to save it. My question was actually to the priest who wrote the article. However, I will try and respond to your response. Guttmacher is not the only one with these results, The World Health Organization agrees with this research and there is no viably sourced evidence contradicting either Guttmacher or the W.H.O's evidence. Also, I have a problem with your comment being riddled with statements accusing Guttmacher of lying, yet you offer no evidence to support their findings as incorrect. Definition of Evidence: the available body of facts or information indicating whether a belief or proposition is true or valid. What Guttmacher has supplied fits the definition of evidence. They have researched these issues in every country of the world, and with integrity. In fact, the abortion rates in Africa and in other certain third world countries, listed in their research, are probably on the low side. The W.H.O. points this out in its research that because many of these countries are extremely poor and don't keep good records and abortion is illegal, the rates listed for abortion are much lower than likely is the reality since only what is recorded can be listed in the research. There is nothing misleading in grouping countries by abortion rates, and abortion and birth control access, as this was the point of the research in this area. They are allowed to research countries by the data they find significant and of use to the world organizations who may need this data or find it constructive. As for the clustering of urban to non-urban - this issue makes no difference since every country with strict laws against abortion had higher rates of abortion and much higher rates of maternal deaths which some of us also care about. Urban or not every country had higher rates around the globe and all countries have urban and rural populations. Our own country has seen an increase in self-aborting around some of our states that have tried to restrict abortion access with nasty results since 2014. As for Ireland, it has been well documented in England that as long as abortion has been legal in England, the Irish have gone to England to procure abortion. Which explains the lower rate documented in Ireland than most countries with banned abortion. The same applies to the Eastern European Countries such as Poland. Polish Women have commonly gone to Germany and other European Countries to procure abortions since the wall came down and this research has been documented as well. Eastern Europeans now have difficult access to both abortions and birth control compared to most Western European Countries, and their rates are still much higher than Western European rates of abortion and maternal deaths. As for the rate drop from before the wall fell in the Eastern Bloc of abortions to now - I don't know why, and neither do you since there is no research on this issue that I have found or you have offered here - so this is pure speculation but I can tell you abortion rates were higher in the U.S. too before birth control was more readily available after the 1980s. It could have been due to poor access to birth control in Russia or the promotion of abortion in Russia before the wall came down. I am merely guessing. I don't disagree that pushing abortion on women in desperate situations will likely increase its happening as well. I am sure China has had hideously high rates of abortion while it mandated no more than one child per couple but that issue is not the subject of my comment or this article. We are not discussing rates of abortion when women are forced to abort. The subject is access and the lack of it to both birth control and abortion increasing, and by how much, abortions happening in countries where there is no governmental pressure to abort. So let me get this straight - you prefer the amount of 42 abortions per 1000 women in Eastern Europe compared to the 16 in 1000 women in Western Europe? That does not sound Pro-Life to me!? Either way 42 unborn lives compared to 16 is the difference of 26 abortions being done above the Western European countries which have the easiest access to both birth control and abortion, compared by the Eastern European Countries which now have more difficult access to both. I don't think there is anything misleading in what the Guttmacher evidence has pointed out but I do believe Pro-Life isn't really Pro-Life, but instead a morality brigade and no matter how damaging the results of its efforts, it will not change its tactics even to save many of the unborn it proclaims to care about, and certainly they will not rethink their destructive goals to criminalize abortion in order to lower maternal death rates to save any women's lives. Also to answer your German statement, Yes, after a certain time of pregnancy, Western European Countries protect the unborn and demand greater medical evidence - physical or emotional for allowing an abortion. However, I know a German couple and this is not tightly restricted until after the first 20 weeks and even then women can get an abortion if the fetus has a serious health issue or the mother does and the women gets a note from her Dr.
As for, "Highly restrictive abortion laws are not associated with lower abortion rates. When countries are grouped according to the grounds under which the procedure is legal, the rate is 37 abortions per 1,000 women of childbearing age where it is prohibited altogether or allowed only to save a woman’s life, compared with 34 per 1,000 where it is available on request, a nonsignificant difference." . . . . I don't consider 3 deaths non-significant per 1,000 women, but that's me. Also if you research further into the World Health Orgs. research online, you will see that most countries that have strict abortion laws also have strict birth control access so in this one area Guttmacher is using very little evidence to back its statement but probably is using the little evidence there is available. Either way, we have more deaths of the unborn with only abortion restricted according to available evidence and that is what I wrote, that abortions would likely be dramatically less in countries with easy access to birth control only but not as low as say Western European Countries or the current rate of the U.S. with Roe v. Wade still intact. None of this research justifies anyone getting an abortion morally. I do not believe it is right or moral or healthy for anyone to get an abortion. However, what we are discussing is criminalizing the act, and since all evidence available proves that this only increases the amount of times this act is done around the world, and definitely causes more women to die and the unborn too, it is more immoral to react with this response to the problem. Jesus never told you or anyone else to condemn another person. In point of fact he specifically told all of his followers not to condemn anyone. You can proclaim abortion a sin, and I would agree with you, but criminalizing it only seeks to punish, after the fact, and neither Jesus nor I would support that action, according to what is written in the Gospels. Do not murder is not the same command as you must jail anyone who murders. Laws in the country are designed to keep the peace and give justice to all citizens, as equally as possible, and also to the unborn, as long as you are not taking rights from the born to do so. God Almighty nor Jesus values the unborn more than their mothers, whether in regards to their lives, or their human dignity, or their freedom and right to act according to their free will over the body God gave to them. Unfortunately, no law could ever be justly made to force women to gestate a baby they do not wish to gestate with the use of their organs since we do not have any such mandate on men, or on women of non-child bearing age. The equivalent would be mandating organ donation to save the lives of others, say of kidneys or bone marrow and you notice we do not have such laws. Sometimes the best and most just solution is no law at all and choosing another avenue. With abortion, both Europe and the U.S. have already proven other routes work much better so why are you still pushing for criminalization? Avoiding the actual evidence, and there is plenty of it, won't avoid the results that the evidence foretells. Women and the unborn are dying in higher amounts while you keep your head in the sand. Time to wake up brother - time to ask yourself are you really backing what Christ would do or maybe it just feels good to try and control women since you won't be effected by any such laws of the kind you want made? Father Sean: With respect, the simple fact that most practicing Catholics use birth control makes it clear that practicing Catholics do not believe everything the Church believes, reveals, and teaches to be true. Yes, Paul that is true. If "pro life" means taking-away the right of women to control their own bodies, it is an idiotic and over-simplistic position. This article is about one woman's particular path in her life, fine. I would guess that there are plenty of women who have had abortions and were thankful for being able to do so. Why not give them equal time? A choice is only a choice when it is well thought out and without duress. Neither applies to 'choosing' abortion. So abortions are only done for the thoughtless or those who are forced under duress? Who are you to decide whether abortion is "well thought out and without duress"? The women are not thoughtless, they have little time to make a decision and they are under extreme duress. Would you want your daughter making any major decision under those circumstance? I certainly wouldn't. Lisa, using your logic and a woman experiencing an unplanned pregnancy is in no position to choose to have a child. I guess these important things need to be left to the men. I hope you are joking when you say we need to leave the decision to men. It seems men are more than involved in the decision to abort, if statistics are correct. Having the love and support of your family is crucial to all mothers. Ignoring that these women are in crisis may comfort those who continue to push it as a right of women, but if your ask those who had an abortion what was their motivating factor, fear of their family's response, and lack of support were their number one, and number two reasons. That's on us, not on them. Men are responsible for all unwanted pregnancies, and men in too many instances are among those pressuring women to terminate an unwanted pregnancy. Men are a major part of the problem. Studies show that from one-third to two-thirds of all abortions involve considerable pressure from significant others for the woman to have an abortion. Law change does not help these women. It makes their situation more overwhelming, more desperate. Is this what we want? Are we really concerned about these women? We are part of the environment in which women resort to abortion. We could do much better. Valuing the developing new life within her more than valuing her seems misguided. We should be doing much more to create a better environment for these women. In public health terms we should be intervening, helping, earlier. Absolutely Jim, and the churches need to speak out in support of these women, first and foremost by removing this ridiculous stigma, and preaching our role as parents is to support our children in their time of need, not try to hide their shortcomings. I was curious about her support for plans to re-criminalize abortion. I have not yet read a detailed policy perspective on this. After 45+ years this is long overdue. Exactly, Frank. The women that I know who have had an abortion have done so after long and careful deliberation, and NONE of them have ever regretted their abortions. What IS ridiculous is that women have to keep fighting for their rights of bodily autonomy when ROE vs Wade already settled that, is absurd. And to say that women should be obligated by anyone to give up those rights in favor of a fetus is outrageous. Pregnancy does not void a woman’s human rights!! I read Ms. Johnson's "Unplanned" with profit. It enriched my teaching about the immorality of abortion in my high school theology class. Ms Johnson's first hand experience is most valuable. Besides such testimony, those who speak for the unborn need to make a persuasive case against two key rationalizations for abortion: 1st, the individualism which asserts that a person's decisions are exclusively their business (proponents of legalized abortion will say "That's her experience. Fine. But don't tell me what to do!") and 2nd, the unborn child is not a person and doesn't fall under the proscription against murder. Ms. Johnson offers a different and valuable perspective. I do believe most pro abortion advocates believe they are helping women. The reality remains, however, that abortion is a fear and shame driven killing procedure and offers nothing in comfort to the women. It is the fear and shame that needs to be addressed if we want to put an end to abortion. If every pro life Catholic parent spoke to their children, long before a pregnancy could occur, and let them know that no matter what they would be there for them, it would be a different world. Sadly, I (and we all) know several young Catholic women who were driven by fear of their parents response, and several Catholic parents driven by shame who pressured their children to have an abortion. That is the truth, we must face the truth, and genuinely stand up for life. I'm so happy my parents did, and I've told my children the same. I wish our priests would call us out on it from time to time. Again, who are you to decide whose behavior is "fear and shame driven"? It has always been fear and shame that forced women to have and raise children that they never wanted. Once pregnant, a woman's uterus comes under state control? What do we do with those who break that law, put them in prison? Seems like fear and shame all over again. I can only go by personal experience regarding the fear and duress upon discovering I was pregnant, and those who I know, all of whom were under tremendous pressure. As far as laws, prison, etc it means little to me because I want someone's decision to be what they truly want, not what they feel is forced upon them. If you want someones decision to be what they truly want, then it sounds like you are pro-choice. If you want their decision to concur with yours, then you are forcing them. You seem confused. No confusion here Jim, I'm 100 percent pro life, from conception to natural death. That doesn't change the fact that I recognize free will. My approach is simply in all circumstances, a loving and welcoming environment that helps people in difficult situations is necessary if we genuinely want to end abortion. That environment comes from the home, the Church and our attitude towards women. To fully respect women means we respect everything about them, including the gift to bear children. Pressuring a woman in any way to terminate a pregnancy is wrong, and disrespectful. Forty some years into this, no, I don't think the solution is in the law, I believe the solution is in the home, one on one, with a promise to stand by her and with programs that support assistance with childcare and education for the mother so that she may be able to support her family, and by once and for all removing this stigma on young women. Sadly, I think the Church has seriously fallen short on this. Priests should be speaking about this on a regular basis. Not on abortion, but on caring for our daughters, on holding our heads up high when our son or daughter becomes a parent, leading by example. The church has also fallen short by not focusing on the man responsible for an unwanted pregnancy. What should be his role? Certainly not to pressure the woman to have an abortion. What is his Christian response? The church's teaching on birth control should be examined critically. It undoubtedly leads to some unwanted pregnancies, within and outside of marriage. No one seems to focus on us guys. In theory, if we all behaved responsibly there would be no unwanted pregnancies, no need for abortion. The earlier preventive measures are employed, the more effective the overall result. Waiting until women are pregnant with unwanted pregnancies is quite late in the prevention process. Blaming them entirely or mostly is harmful, not helpful. Maybe for starters members of the Knights of Columbus could take pledges to act responsibly, to never contribute to an unwanted pregnancy. Just curious Frank T, do you know any woman who was forced to have and raise a child she did not want? I don't but I know several woman who regret their decision to abort, but not one woman who regrets she chose life. Not one. As much as I agree abortion is never really a right choice, as I also believe it harms women. Unfortunately, many women who give their child up for adoption feel the same sense of loss, and go thru identical periods of deep depression, as having an abortion causes. These facts are not something Pro-life seems inclined to talk about either. Although, I do believe abortion is a faithless often desperate act, I believe the right to abort must remain in all states and federally protected and legal. The facts are that in every country in the world where abortion is a crime or hard to access, there are greater numbers of abortion occurring and that amount is much more greater when those countries do not allow access to free birth control too. Facts are Facts. The U.S. and Western Europe have the lowest rates of abortion by large amounts and they also have the easiest access to abortion and birth control. I would abort a 100 x over handing my child to a stranger to raise.. I would never, ever do that.. I also do not know anyone who has ever regretted her decision to abort, and those decisions were taken not out of fear or shame, but because the woman wasn't able, or willing to become a mother that time.. My personal opinion is that abortions must always remain, legal, safe- and hopefully rare, and that we should all remember that we have ironclad 'separation of church and state', and that states can't make decisions for others, based on someone else's religious beliefs. I agree Nora that women who give up their children for adoption suffer greatly. It is a very selfless act, but all efforts should be made within the family to help the mother should she want to keep her child, which most do. I agree with that - we should be helping these women and be willing to pay with taxes what is necessary to truly raise children, if we are going to point fingers at any women. Many of these women do not have families that can or are willing to afford to help them keep their children. Concerned pro-lifers need to be willing to financially support thru taxation these children they are condemning women for not being willing to have. That is what Jesus would do. Lisa, I know too many people with regrets about marrying and child rearing, both. that I don't go for broad generalizations anymore. I go for personal freedom. I was a teenager when Roe v. Wade was decided, and have often wondered how many lives could have been saved if the anti-abotion movement had spent even half of their political effort (over the past 45 years) on advancing and supporting social programs which would make it possible for a young woman, alone, to imagine having her baby, keeping it, and still being able to pursue her education and career; instead of aligning with the American poltical party which supports making abortion illegal, while zealously opposing programs like universal medical care, child care, and subsidized higher education. The message to young women has been "have the baby, then give it away- or pull yourself up by your bootstraps." A society that wants vulnerable women to welcome "unplanned" children (no matter their personal circumstances) needs to be one which supports their decisions with the material and spiritual support needed to be pregnant, deliver a child, and give that child a decent life. Very well stated, Julie. If one were to judge by actions, then it would seem that much of the anti-abortion movement is interested in children only up to the moment that they are born, ie, they are mostly interested in fetuses, and not in actual children. Instead of calling itself pro-life, the movement ought to call itself pro-birth and honestly admit that the continued welfare of those born children is clearly not a strong enough interest to enact policies to help those children from birth onward. And as to mothers -- there is no concern at all. No one is arguing that abortion is a good thing and I feel for Mrs. Johnson. Doctors who perform abortions do not like to perform later term abortions, especially if the pregnancy is further along than the patient discloses. Most abortions are microscopic. This does not excuse them but it does take the drama out of the argument. As bad as abortions are, banning them is worse, even if only the doctors are sanctioned this would drive the procedures (especially the late term ones). Doctors who perform such abortions do so because they know what a ban would be like for women, not because they enjoy taking life. (Yes, there are exceptions, but they prove the rule. That early abortions look like procedures to deal with miscarriage is no accident. Indeed, they are also called abortions, though the term is therapeutic. Having the police power sort between the two is considered by most to be a bridge too far. Mrs. Johnson's opinion on the overturning of Roe is movement dogma but is not at all true. Any justice that went to an Ivy League Law School since Roe knows why it was rightly decided on constitutional grounds. That was true of both Bush II and Trump, both of whom testified to that when being confirmed but the Bush appointees actually voted that way on Gonzalez. The annual March against Roe shows how out of touch the movement is from the legal realities. There will be no Brown v Board moment on Roe. Plessy was decided on the basis of state sovereignty over 14th Amendment law. Roe comes from Brown, as do Latino and gay rights. Overturning Roe would bring back Plessy and undo Brown to Perry. That would shock the conscience. Overturning Roe can occur by federal (and only federal) statute under the enforcement powers granted Congress in the 14th Amendment. Doing so would grant a positive right to life, meaning it is an action OF the state rather than a restriction on the state. The unborn already have such rights from the government. The state cannot execute a pregnant woman or impose a one child policy. No one disagrees with that right to life. "You cannot be a single issue voter, because then they've got you," said my wise bishop some years ago. Although medical progress makes the anti-abortion case, "pro-life" is sadly being used as a wedge to split us apart. It's become slogan that enables an administration and political party who are otherwise opposed to other teachings of the Church ranging from refugees to general health care to stewardship of creation.. When we never deviate from Christ's seamless garment of loving embrace across the board, we will find many eager new friends and political supporters. As matters stand now, "pro life" to many thoughtful people means only "pro-birth." Her statement that Planned Parenthood sells abortion as its main revenue item is untrue. I too was a volunteer at Planned Parenthood and what PP is all about is 1) contraception, and 2) routine gyn exams. Abortions are a small percentage of what happens there. As a volunteer, I answered questions about contraception and worked in a vasectomy clinic (for men) .... never saw abortions. PP is a good place with good people whose purpose is to help women and men too with their reproductive health. For those of view who may not have noticed -- this is a film about something that occurred in October, 2009 -- almost 10 years ago. And here is a link to a different perspective on the situation, a piece that was written at the time of the sudden conversion of Ms. Johnson: https://rewire.news/article/2009/11/03/planned-parenthood-directors-holes-story-revealed-in-recent-radio-interview/. Jacqueline, the fact that this woman acknowledges that the young women coming in are frightened and scared, yet she chooses to criticize the lack of any extended care and instead decides to support the 'quick fix' no follow up care solution of abortion is troubling. Wouldn't the experience show her that indeed these young women need care, and the solution is fighting to get support and services for them, rather than telling them 'ya, there's no solution for you other than to abort your child'. and never see them again. A little bit of the pot calling the kettle black here I think. For pro-lifers who say women experience regret after an abortion ... they actually don't. More than 95 percent of women surveyed in a new U.S. study said they didn’t regret having an abortion and felt that the procedure was the right decision for them. "For pro-lifers who say women experience regret after an abortion ... they actually don't. ... 95 percent ..."
It is bizarre to cite a study that suggests that 5% of women regret having an abortion as evidence, that women don't experience regret after abortion. 5% is something different than 0%. To put it into perspective, with 700000 abortions per year, 5% regretting would mean 35000 regretting their abortions; or 100 women per day having an abortion and regretting it later; and furthermore perspective, any side effect with frequency between 1 and 10% would be in pharmacy called "common" (with very common being above 10%). Regret is a common side effect of abortion pill. is actually a true statement if the study you cite correctly estimated the extent of regret given the usual meaning of "common" in pharmaceutical use. Common: between 1 in 10 and 1 in 100 people are affected"
Writing "most actually don't" instead of "they actually don't" and your post would be a lot less bizarre. And besides a very common effect of abortion is stopping a human heartbeat (as heart starts to beat around 6 weeks and most abortions are performed later and performed on mostly healthy children, it is an effect occurring very common according to the medical/pharmaceutical use of the word). The comments above are very revealing, and horritfying. Several falsely self-identifying catholics (they are actually self-excommunicated, according to Church discipline, not that they care) are fully on board with abortion, not just as a tragic alternative in a desperate situation (the main lie of the whole cause), but are actively enthralled with it, as the chief symbol of woman power. Imagine choosing to gain power by sacrificing millions of innocent children. Incredible. What form of slavery, racism, or sexism, or whateverism is worse than that? The seamless garment has been a cloak to cover up the massacre. This is the crime of the century.